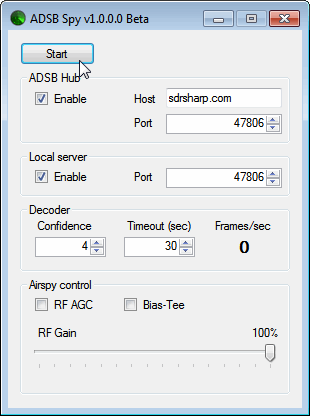 Youssef, the main programmer of SDR# and creator of the Airspy software defined radio has just released a beta version of an ADS-B decoder for the Airspy. The software is called “ADSB Spy” and is similar in operation to ADSB# which is used with the RTL-SDR dongle. The increased sensitivity and lower noise floor of the Airspy should help ADS-B enthusiasts get longer ranges and more aircraft on their screen. The beta version of ADSB Spy can be downloaded at http://www.airspy.com/downloads/adsbspy.zip. Anyone know how to make this work with a HackRF One or RTL-SDR??? Please anybody had luck to Decode the GOMX-3 Satellite? If yes please which program is required? Not sure what happened to ADSB#. It doesn’t seem to be included in the SDR# download any more. I suggest you use the alternatives like RTL1090, dump1090 and modesdeco. See https://www.rtl-sdr.com/adsb-aircraft-radar-with-rtl-sdr/. or other possibilities for going ADS-B on SDRFun receiver.